Celebrities on the Road: You've been Papped! Thanks mainly to the media, celebs around the world face an uphill struggle to keep their private lives private. This is particularly challenging when it comes to motoring misdemeanours, as even the slightest knock ends up plastered all over the front page of the tabloids. 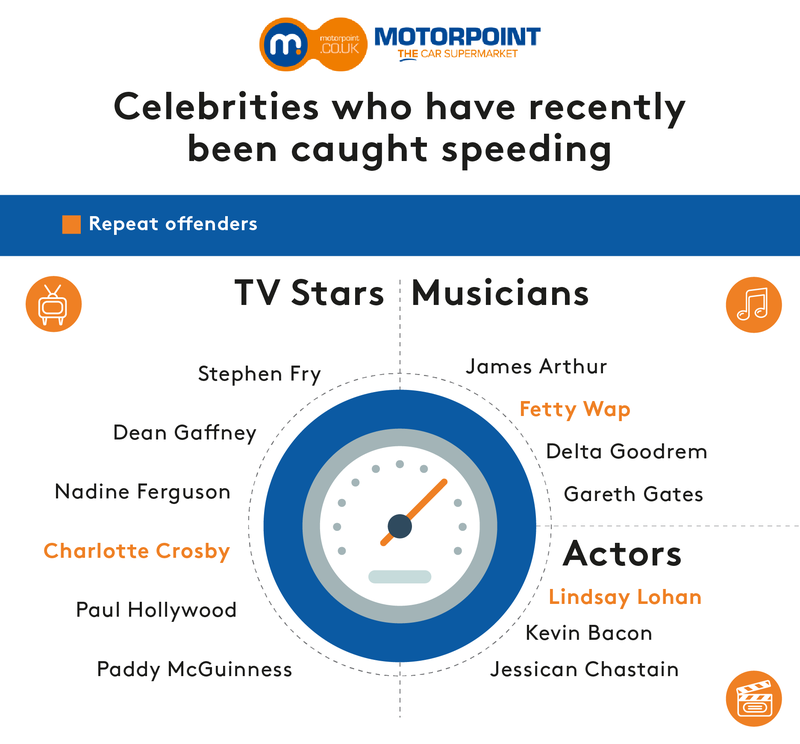 Some celebs, however, are worse than others when it comes to roadway wrongdoings, so the team at Motorpoint headed online to find out exactly who are the most badly behaved. This involved us scouring the news sites to uncover the best stories and see who has caused the biggest stir behind the wheel recently. 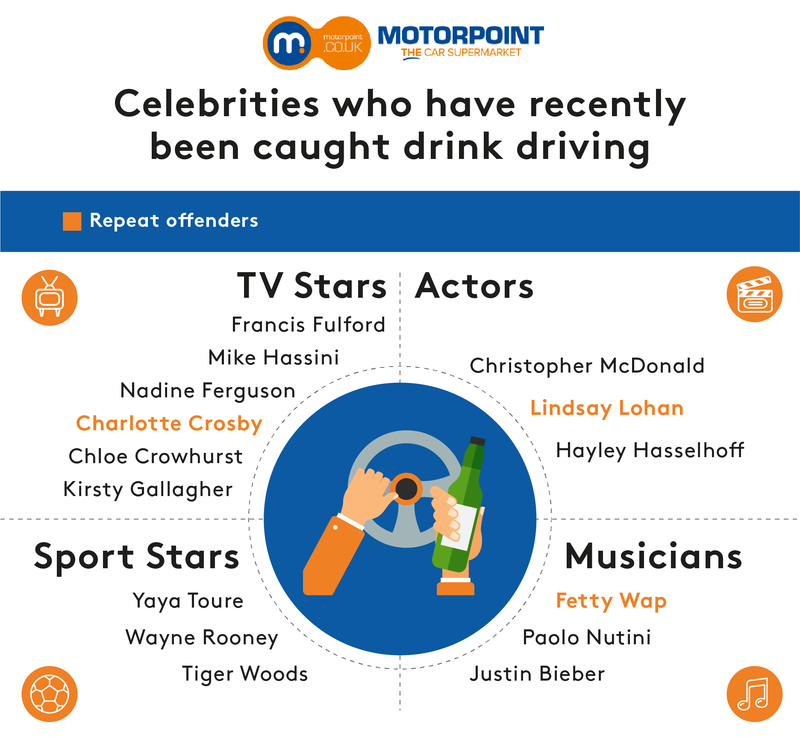 By looking online for the phrase “celebrity drink driving”, it didn’t take us long to find an array of famous faces that were caught in their vehicles after having had one too many. There was one individual though who raised the bar to new heights – probably from spending too long at the bar. Everton footballer Wayne Rooney was pulled over and caught driving at three times the legal drink drive limit. 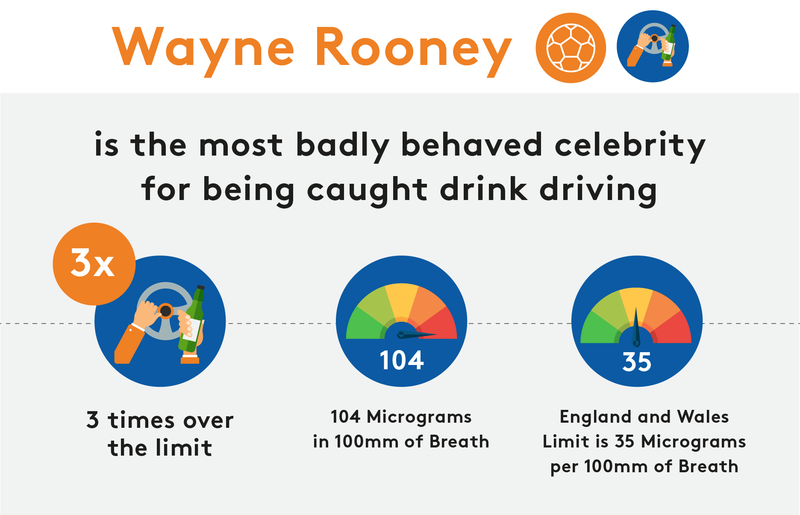 He had 104 micrograms in 100 millilitres of breath (when the current drink-drive limit in England and Wales is 35 micrograms per 100 millilitres of breath). 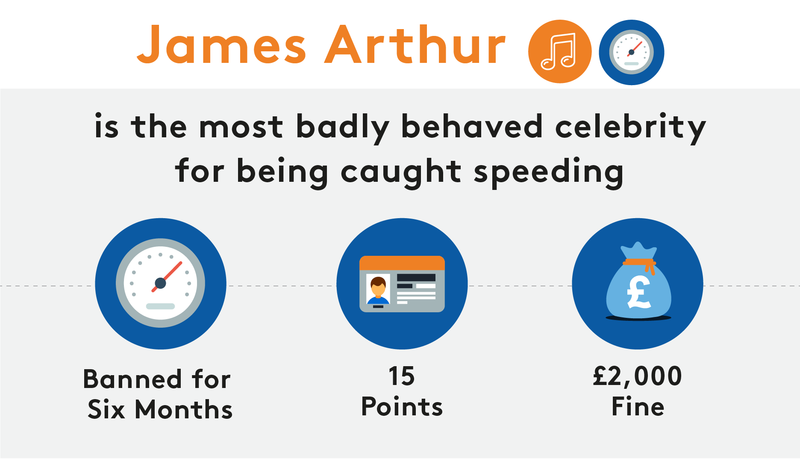 Once again though, there was a certain individual who managed to amass a staggering 15 points from speeding, namely musician James Arthur. It was reported that the former X-Factor winner was banned for six months and received a £2,000 fine. Wayne Rooney and James Arthur were not the only ones though to fall foul of the letter of the law. Geordie Shore’s Stephen Bear received parking fines during his two-day stay at the Malmaison in Newcastle when he parked his purple Mercedes-Benz directly outside the hotel. Clearly a glutton for punishment, he then decided while in Camden, North London, to use a creepy orange Halloween mask strapped to the passenger seat, perhaps in a bid to deter traffic wardens, while parked on a double yellow line for two hours. Unfortunately for Stephen Bear, his ruse didn’t work, and he was issued with a fine. Stephen Bear has nothing though on one of the world’s most-famous families when it comes to using their phones when driving. We are of course referring to the Kardashians, more specifically Kim, Kylie and Kendall, who are regularly in the press for this offence. While such driving offences make great headlines for the tabloids, there is a serious point here, namely that they are all breaking the law and potentially putting themselves and others at risk. It’s one thing to follow your favourite celeb through the media but it’s quite another to imitate their habits when behind the wheel. As Wayne Rooney and others can testify – it’s not a price worth paying – no matter how famous you may or may not be.